It was 10 years ago on this day that George and I went on our first date. In Athens, at a bar, right next to what would be our first apartment together, only 3 months later. We drunk strawberry daiquiris and he gave me as a very late birthday present a book about spices. Ten years! I cannot believe they went by so fast! I guess time flies when you are happy! One of George's favourite desserts is crepes. Since he went gluten free, a couple years ago, I tried different recipes with different flours. Some of them were a success some of them were not. But he still ate them - such a nice guy. Now, I might have mentioned before that I don't really believe in coincidences. For me, what we define as random events are more like road signs, put there to guide us to our destiny. Definitely not random and in my case, today, my destiny was to make this beautiful "cake" of crepes and pastry cream to celebrate our ten year anniversary. Because it was like this cake was following me around. Every time I went on Pinterest there was a different version of this French classic, beckoning me to click. These first signs are so easy to bypass, forget or simply ignore. 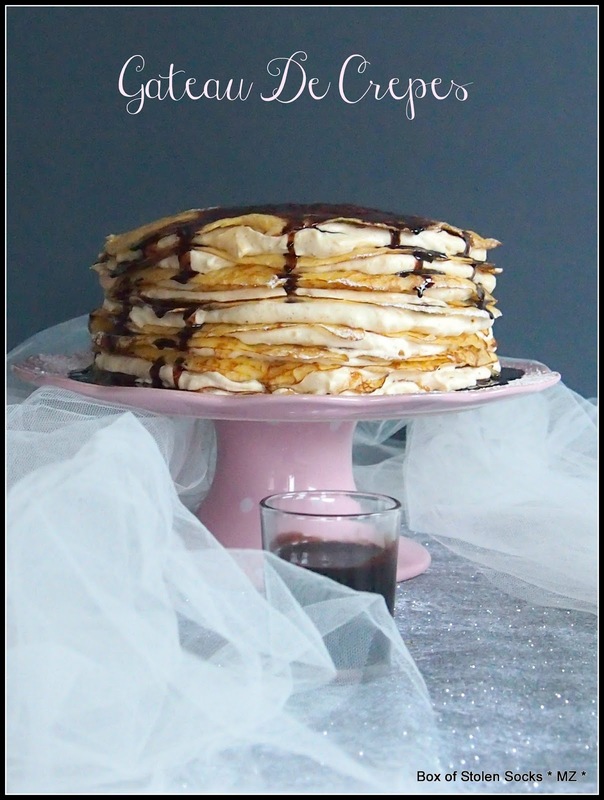 I kept going on Pinterest seeing stack upon stack of crepes and ignoring them, denying my destiny until I read this week's French Fridays with Dorie recipe Butter and Rum Crepes. 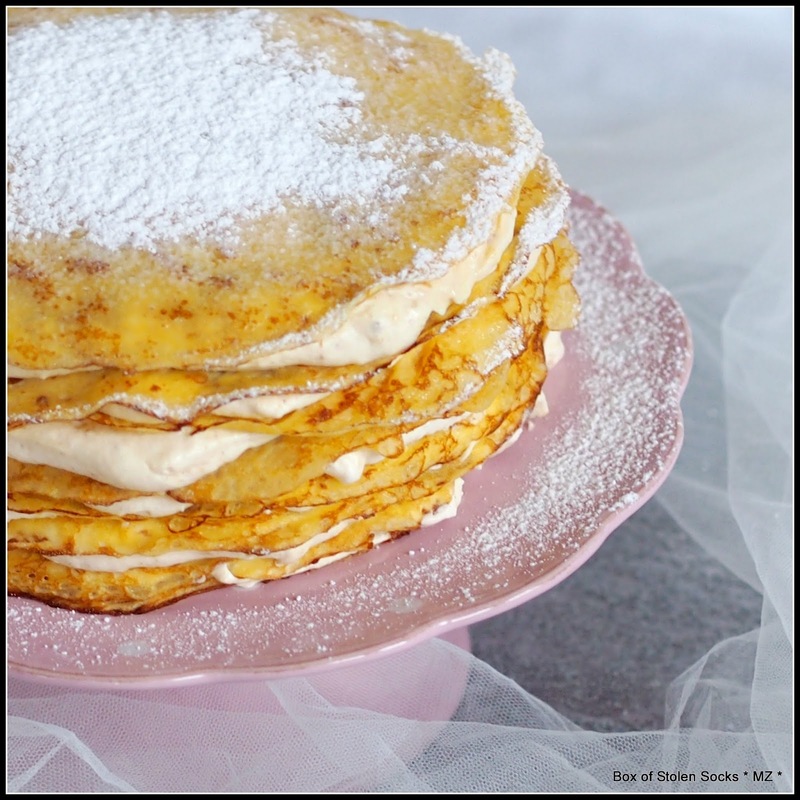 There at the end of the two page recipe was Dorie's Bonne Idee - an alternative way of approaching the crepes by making a Gateau de Crepes. Yes! Destiny! Twenty or so, soft vanilla scented crepes, one on top of the other and in between the pastry cream of my dreams. The praline pastry cream I fell in love with when I made the Paris-Brest. As I said, I made crepes before. Some were good and came out in one piece, perfectly round, airy and thin. Some were not so lucky. I even managed to flip a couple with the pan, the way the chefs do it on TV. Now I had to make twenty of the looking more or less the same. Scary!!! To be on the safe side I tripled Dorie's original recipe - you need a double dose to make the amount of crepes needed for the Gateau but what if I run out of nice looking crepes halfway up? I left the batter in the fridge overnight and started flipping them first thing in the morning. I had prepared the praline pastry cream the night before and just mixed in some whipped cream a few minutes before I assembled the cake. My Gateau came out very rustic looking. Precision was never my strongest point in baking anyway. The taste though was absolutely fantastic! George loved it! Adapted from "Around my French Table" by Dorie Greenspan - The pastry cream was adapted by Joe Pastry. You can make the Praline Pastry Cream the day before and refrigerate until you use it. To make the praline paste: Spread the almonds and the hazelnuts on a silicon mat or a piece of baking paper. They have to be close together but not on top of each other. Set it aside. Put a heavy bottomed saucepan over a medium heat and combine the sugar and the water. Swirl the pan around to combine them but DON'T stir them. When the syrup reaches a dark amber colour, anything between 10 - 15 minutes remove it from the heat and carefully pour the caramel over the nuts. Once cooled brake it into pieces and place it in a food processor. Process it until it becomes fine and then start adding the oil, gradually, one tablespoon at a time, until a paste begins to form. You might not have to use all the oil or you might have to use more. Keep it in the fridge, covered, until the time comes to mix it with the pastry cream. For the pastry cream: Whisk the egg yolks together with the sugar and the cornflour in a medium, heavy bottomed saucepan until they are all blended very well. Bring the milk to a boil in another smaller saucepan. Drizzle a little of the milk on to the yolk mixture, whisking all the time. Then add the remaining milk in a steady stream, still whisking. Put the pan over medium heat and "whisking vigorously, constantly and thoroughly" bring the mixture to a boil. Keep whisking for 1 or 2 more minutes and them pull the pan from the heat. Whisk in the vanilla seeds. Let the cream stand for 5 minutes and then whisk in the pieces of butter, one at a time until all the butter is incorporated and the cream is smooth. Put the cream into a bowl, press a piece of plastic wrap against its surface and refrigerate. For the Crepes: The crepe batter has to stay in the fridge for at least 2 hours before you use it. I suggest you make it the day before and let it stay overnight in the fridge. Melt the butter and let it cool. Mix the sugar with the lemon and orange zest together. Put the eggs,vanilla, sugar with zest, milk and salt in a blender and mix on medium speed. Pour in the butter and blend until it is well combined. Add the flour and pulse until it is blended. Be careful not to over-mix it! Pour the batter in a pitcher, cover and refrigerate for up to one day. It should have the consistency of heavy double cream. If it is thicker than this you can add a splash of milk to lighten it. Assemble the cake: Take the pastry cream and praline out of the fridge and let them come to room temperature. Mix about 80 to 100gr of the praline with pastry cream. Set aside. Bring the crepe batter to room temperature. Place a 9-inch/20cm nonstick pan over medium heat. Swab the surface with vegetable oil. Add about 3 tablespoons of batter and swirl the pan to cover the surface. Cook until the bottom just begins to brown, no more than 1 minute. Using a spatula lift an edge and flip the crepe. Use your fingers - it is hot but it is the safest way. Cook on the other side for just a few seconds. 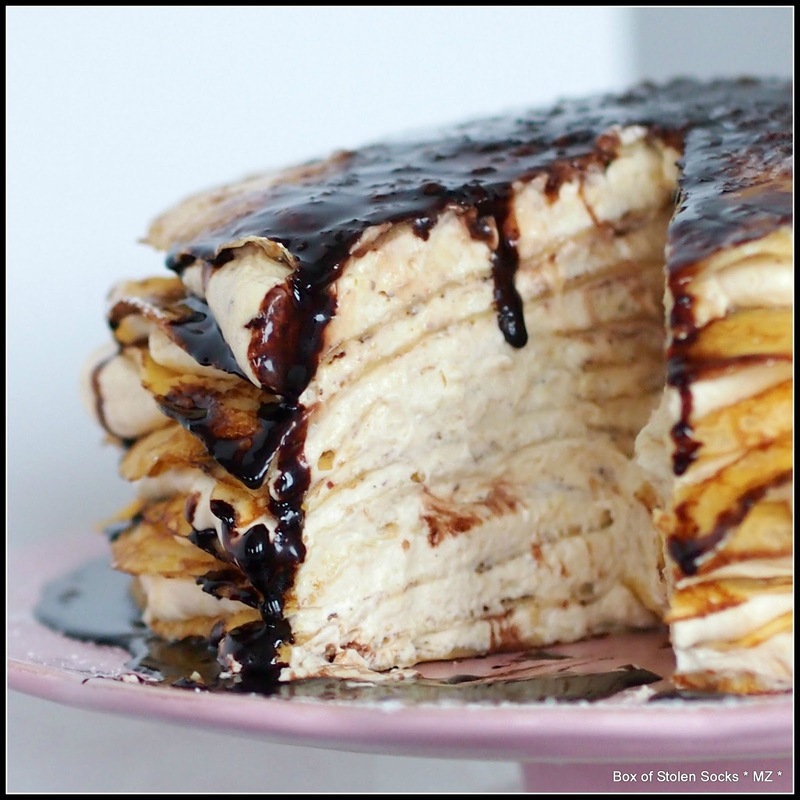 Carefully slide the crepe onto a baking sheet lined with parchment paper. Repeat until you have about 18 - 20 perfect crepes. Whip the heavy cream with 1 tablespoon of sugar. Fold it into the praline pastry cream. It will become fluffy and lighter. 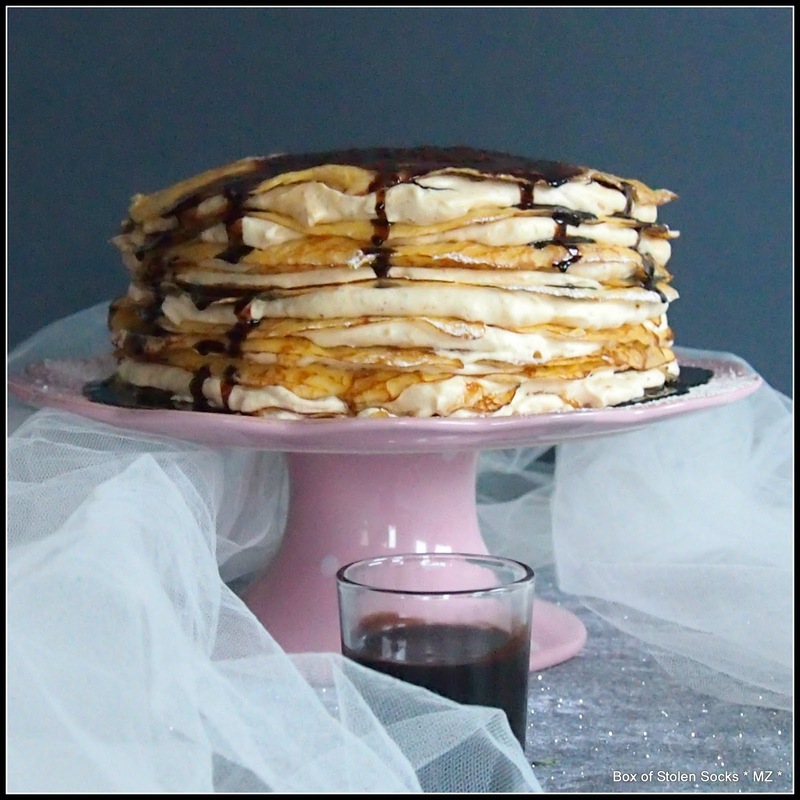 Lay one crepe on a cake stand. Cover with a layer of pastry cream using an icing spatula. 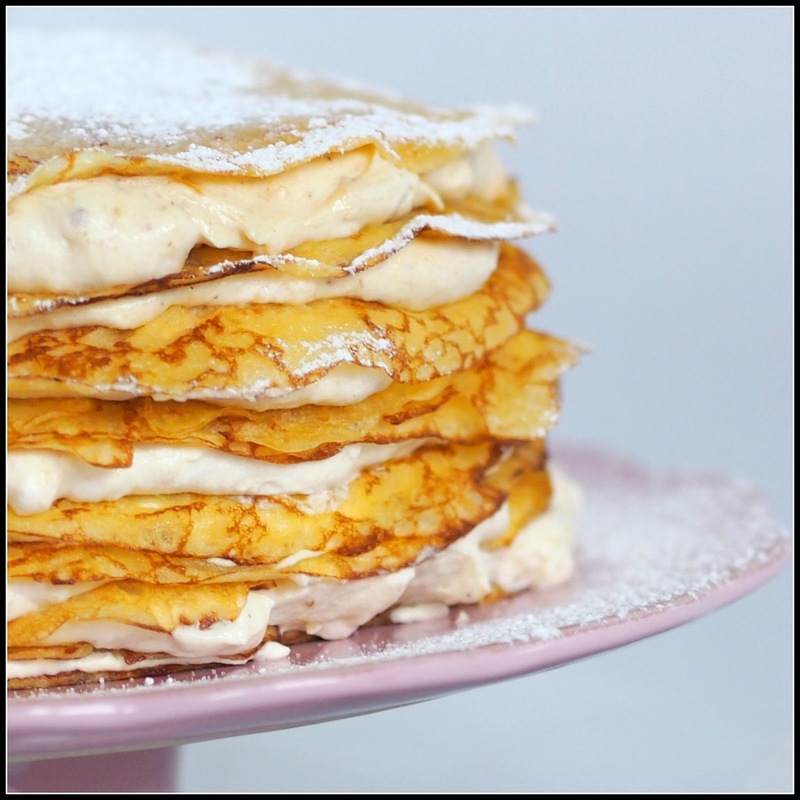 Cover with a crepe and repeat until you use all your pastry cream. Make sure to keep a nice looking crepe to put on top. Chill the cake for at least 2 hours! Before serving you can sprinkle it with icing sugar or with chocolate syrup. Make the Chocolate Syrup: Whisk the sugar, cacao powder, water and salt together in a small saucepan until they combine. Place over medium heat and bring to a boil whisking frequently. Reduce heat to low and simmer for 5 minutes until it thickens. Remove from heat and cool. You can store it in a bottle in the refrigerator.